The application of Micro Electro Mechanical Systems (MEMS) in the biomedical field is leading to a new generation of medical devices. MEMS for biomedical applications reviews the wealth of recent research on fabrication technologies and applications of this exciting technology. The book is divided into four parts: Part one introduces the fundamentals of MEMS for biomedical applications, exploring the microfabrication of polymers and reviewing sensor and actuator mechanisms. Part two describes applications of MEMS for biomedical sensing and diagnostic applications. MEMS for in vivo sensing and electrical impedance spectroscopy are investigated, along with ultrasonic transducers, and lab-on-chip devices. MEMS for tissue engineering and clinical applications are the focus of part three, which considers cell culture and tissue scaffolding devices, BioMEMS for drug delivery and minimally invasive medical procedures. Finally, part four reviews emerging biomedical applications of MEMS, from implantable neuroprobes and ocular implants to cellular microinjection and hybrid MEMS. 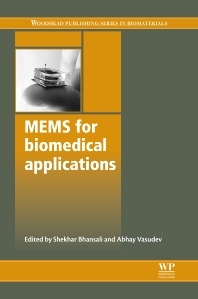 With its distinguished editors and international team of expert contributors, MEMS for biomedical applications provides an authoritative review for scientists and manufacturers involved in the design and development of medical devices as well as clinicians using this important technology. Shekhar Bhansali is the Alcatel-Lucent Professor and the Chair of the Department of Electrical and Computer Engineering at Florida International University, USA. Abhay Vasudev is a Graduate Researcher at Florida International University’s bioMEMS and Microsystems Lab.